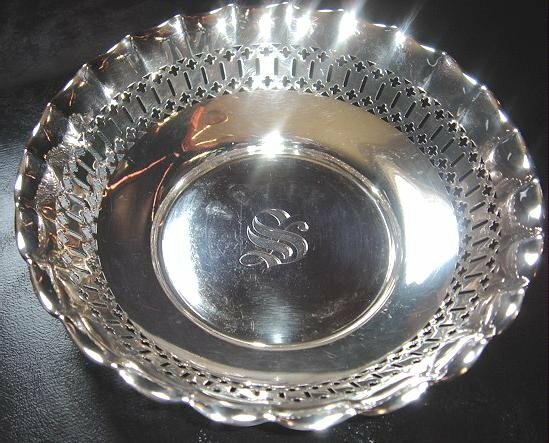 You may purchase this handsome sterling silver bowl by Gorham. The pattern number is 640. I cannot decipher the year mark with certainty, but it might be 1922. The bowl is fluted and pierced, giving it some real style. It is 5 1/8" in diameter. There is a very beautiful Old English "S" monogram in the center of the bowl. See the monogram and some of the filigree work in the photo below. US SHIPPING INCLUDES DELIVERY CONFIRMATION. I can highly recommend Wright's Silver Cream to clean all of your silver. I have 4# tubs for sale. If you are a silver dealer or have a large collection, you may be especially interested.